This piece was originally published by Congressional Hunger Center on their website on October 31, 2018. You can see the original post HERE. The nearly 600 alums of the Congressional Hunger Center’s Emerson National and Leland International Hunger Fellows programs are continuing to have an impact in the movement to end hunger in the U.S. and around the world. That’s the main finding from the Congressional Hunger Center’s new report, “Fighting Hunger by Developing Leaders: How Hunger Fellows Continue to Shape the World,” which was released today at an event on Capitol Hill to commemorate the Congressional Hunger Center’s 25th anniversary. The report combines data on alum outcomes and career paths with profiles of alums who are working to end poverty and hunger through work with nonprofits, foundations, NGOs, and all levels of government. 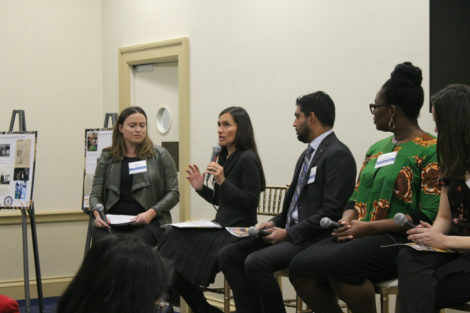 L to R: Eileen Hyde, Damiana Astudillo, Indivar Dutta-Gupta, Mercy Erhiawarien, and Bridget Murphy participate in an Alum Panel Discussion at the Rayburn House Office Building on Oct. 31st. The report was released formally at an event at the Rayburn House Office Building on Wednesday, October 31, featuring a panel discussion of Hunger Fellow alums including Damiana Astudillo, Director of Agriculture at the Millennium Challenge Corporation; Indivar Dutta-Gupta, Co-Director of the Georgetown Center on Poverty and Inequality; Mercy Erhiawarien, Executive Director of Heritage Africa; and Bridget Murphy, Director of the Parent Engagement Institute at the Logan Square Neighborhood Association. The discussion was moderated by Eileen Hyde. Watch the live video of the discussion here. At the event, the Congressional Hunger Center also announced a new partnership with the University of Virginia’s Frank Batten School of Leadership and Public Policy to provide tuition assistance to successfully admitted graduates of the Hunger Fellow Programs. Both Hunger Fellow Programs are accepting applications for the next classes of fellows now through January 14th, 2019.